Phone 111 immediately if the person who is choking can't breathe, talk, or cough, or if they become unconscious. If they stop breathing, start CPR for children and adults or for babies. Choking happens when something – often food – becomes stuck in a person's windpipe. This makes it difficult, or impossible, to breathe air in. How do I know if someone is choking? Someone who is choking will have difficulty breathing and talking. They may be using hand signals to point to their throat. Their skin may be pale or turning blue. They will be showing distress. How can I help someone who is choking? Encourage the person to cough. If you can see what is causing the blockage, remove it using your thumb and two fingers. Do NOT put your fingers into their mouth, unless you can see the object and grab it. If you can't remove it safely you may end up pushing it further down. Give up to five back blows, between their shoulder blades, using the heel of your hand. See the first column in the diagram on the right. If it is a baby, make sure their head is supported. Check their mouth to see if you have dislodged the object. For an adult or child, give chest thrusts. See the second column in the diagram on the right. For a baby, give chest thrusts using your fingers. See the second column in the diagram on the right. Continue giving back blows and chest thrusts until either the object has come out or an ambulance arrives. If they stop breathing start CPR for children and adults or for babies. Stand behind the person, wrapping your arm around their chest. Make a fist with one hand. Place your fist with the thumb side against their breastbone. Grasp your fist with your other hand and give a quick inwards thrust. This video shows you what to do if a baby is choking. 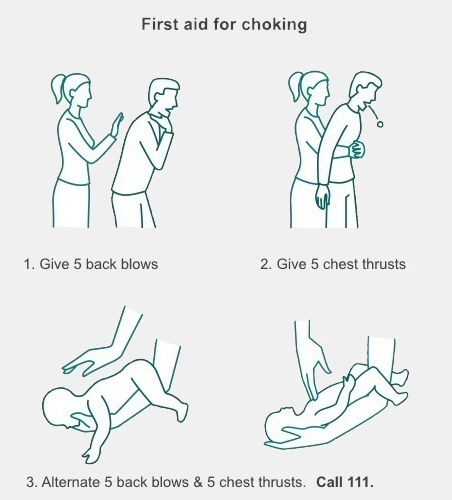 Information about what can cause choking, and how to help someone who is choking. New Zealand Resuscitation Council – ANZCOR guidelines 2016:update for first aid providers, retrieved November 2016.